I am having this problem too. I am on a Nucleus+ with the NAS on my network. Latest version of Roon. Been going for a few days now. Have rebooted the Nucleus+ but no good. Any ideas? You might have a corrupt file in your library that is stopping things from progressing. Support should pick this up in due course so sit tight until they get to this. I removed my local library from Roon, and the scan that I showed kept on going. 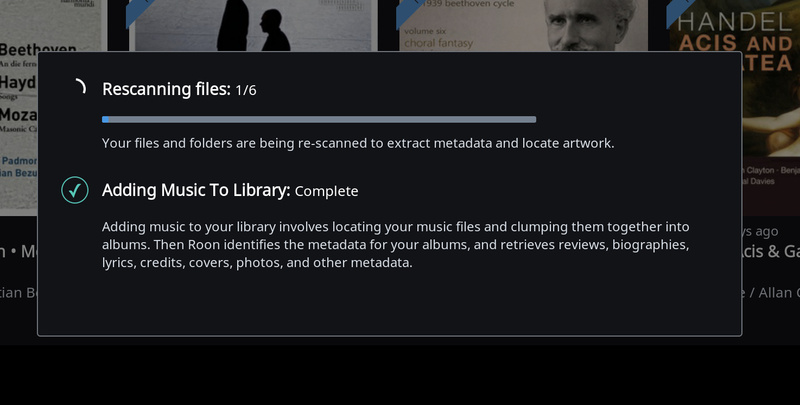 I wonder if this is an issue with TIDAL or Qobuz (I have both on Roon). Unfortunately there is no mechanism for me to see what it is it is trying to scan for. FWIW, it seems to be frozen in the same 14 files regardless -it always shows “Rescanning files: 1/14” (in my case). Seems to be something erroring out. Would love to be able to get a tad more verbose detail! Thanks for contacting us regrading this issue. I have gone ahead and enabled diagnostics mode for your account and what this action will do is next time your Core is active, a set of logs will automatically be generated and uploaded to our servers for analysis. I will be sure to let you know once I review them for any possible sources of this issue. Thx @noris. Can you give me the path to those files? I have many “Lady Soul” versions. I believe these tracks reside on Qobuz. It looks like the album that you are looking for is “Lady Soul (With Bonus Selections)”. Ah ok. I’ve just removed that album from my favorites, I will check when I get home whether it stopped scanning. What piece of info tells you it’s from Qobuz? Your logs contain similar error traces from one’s I’ve seen before with Qobuz albums in other cases. Do let me know if the issue is resolved once you get home. Removing this from the library stopped the scanning. FWIW, the offending album came from TIDAL not Qobuz. In all likelihood, the publisher’s metadata is causing the issue. Thanks for letting me know that the album came from TIDAL and not Qobuz. This is certainly strange because when I’ve seen this issue it was only for albums from Qobuz, but I will let the QA team know this info in case they want to take a closer look. Either way, glad to hear the issue is resolved on your end!